We feel a special affinity with Sven and his team at North Light Fibers. Their island is four times smaller than ours but the same distance from the coast of Rhode Island as we are from France. 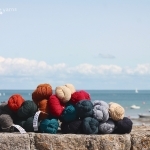 Their goal is to make world class handcrafted artisanal yarns from exotic fibers and demonstrate that year round manufacturing can work in a highly seasonal location. 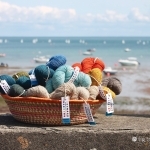 Their yarn is 100% Block Island produced – from washing and dying to carding, spinning and finishing and as such, is a unique product.